While in Santorini, hike up some of Greece's large, active volcanos as you explore craters, springs and the breathtaking views from above. It was actually Volcano Hiking and Hot Springs Swim. The volcano hiking was strenuous as described, but breathtaking. The volcano hiking was strenuous as described, but breathtaking. Our guide was knowledgeable and entertaining. Very good and informative. Enjoyed the ride on the sailing boat and the tour up to the volcano. too hard a walk, not worth it, best to get up to towns at santo as quick as u can as time is very limited, ship only in port 7 hours, no way. An interesting walk up to several volcano craters, with a great view, and the opportunity to walk on ground that was steaming in places. We also went on a short swim to a hot spring, which was fun but not as interesting. 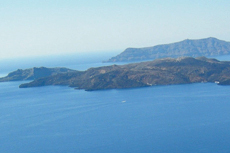 In Santorini, we’d done the usual tours so we booked the “SO65 Kaiki Ride and Volcano Hike”. If you really want to see a volcano do not take this tour. Brilliant views from the volcano although a big hike. Brilliant views from the volcano although a big hike. Guide was really knowledgeable and the swimming in the hot springs was brilliant. Don&apos;t wear new swimwear though, the mud stays on your skin for days! The excursion itself was very good. The excursion itself was very good. The problem was we had a very late start from the ship and did not have enough time to enjoy Santorini the rest of the day. We really enjoyed this excursion! Great tour! The boat ride was great and we loved hearing the history of the volcano. We enjoyed the hike and the amazing views. The thermal springs were not so thermal. Everyone said the water was freezing. We chose not to go in. Very good tour visiting volcanic area and. Very good tour visiting volcanic area and. The hills above where the ship was docked. The welcome from the people here was lovely. The tour was managed well. My friend loves vulcanos and I love shipspotting. Amazing!! Go on the donkeys! So much fun. Beautiful place. Highlight of the trip! Our guide was excellent and extremely informative. We had already been to Santorini, so this hiking and swimming tour was a perfect way to spend a half day. This was good for a ship&apos;s tour. We enjoyed the hike very much.